I had been to Chaco Canyon on a memorable excursion 15 years ago. I was able to revisit there the summer of 2014. I wanted to stand where humans had stood a thousand years ago, in a land that had not changed. I wanted to see what those people had seen. A priority on this visit was to see how they used local resources for architecture and document their meticulous craftsmanship in masonry. 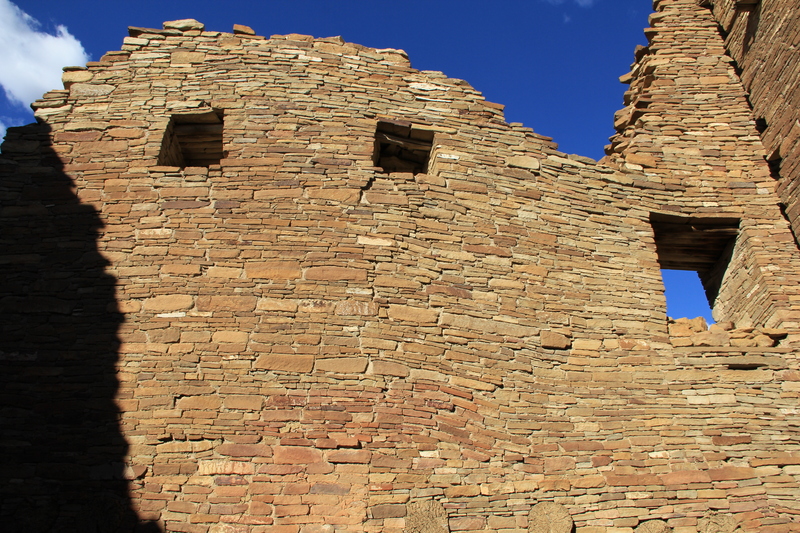 At about 900 AD there was an explosion of activity in all facets of life, work and culture in Chaco Canyon. What influenced the people there to build huge pueblos and great houses is an unknown mystery. The Chacoans achieved great technical skill as masons. Working with stone tools, they erected vast communal buildings that are still worthy of admiration today. Using available resources and long range planning, major buildings were started that took generations to finish. It took remarkable planning to locate doors, passageways, ventilation and other architectural features for rooms that might not be built for another 50 years. 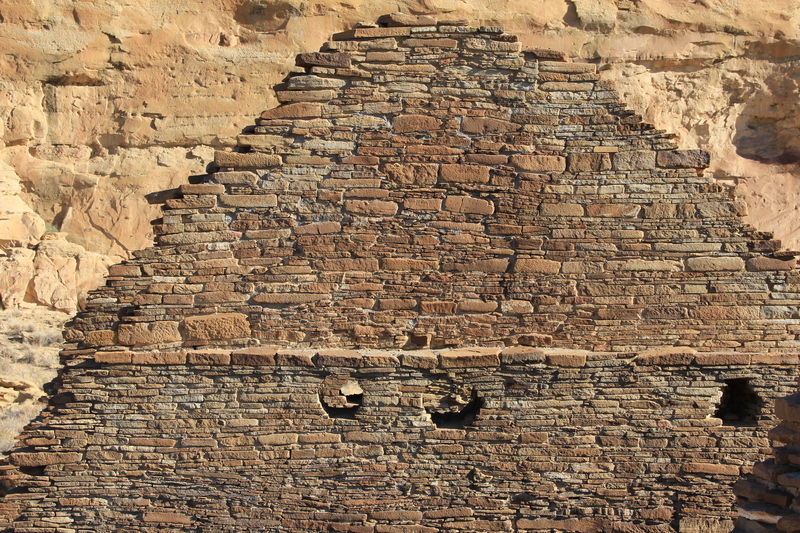 Southwestern archeologists all agree the Chacoan masonry workmanship was outstanding. 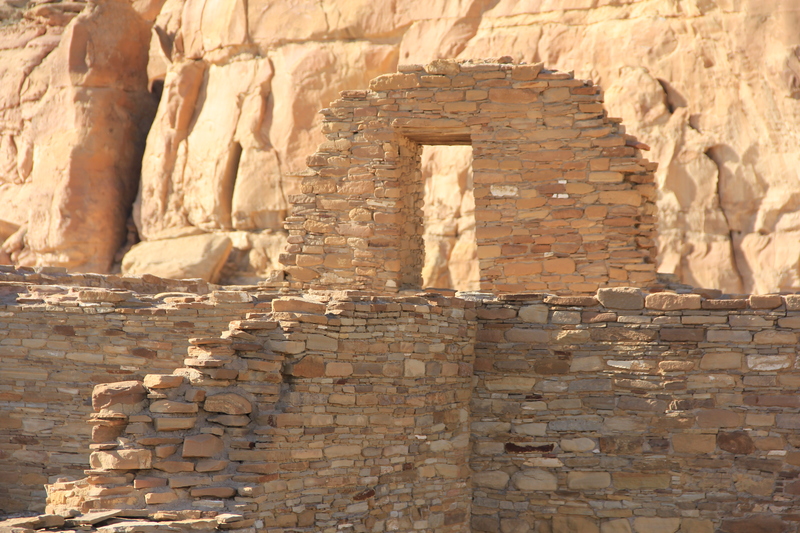 Chacoan masonry styles evolved over the centuries. The photo above shows the bottom section of the wall laid with all thin tabular stones. Above that bands of thicker stones are incorporated in the construction. These differences allow archeologists to relate the different construction periods. Early construction was done using simple walls one stone thick. Later the multistory great houses were built with a rubble core capped with a veneer of thin sandstone slabs, sometimes in mosaic-like patterns. 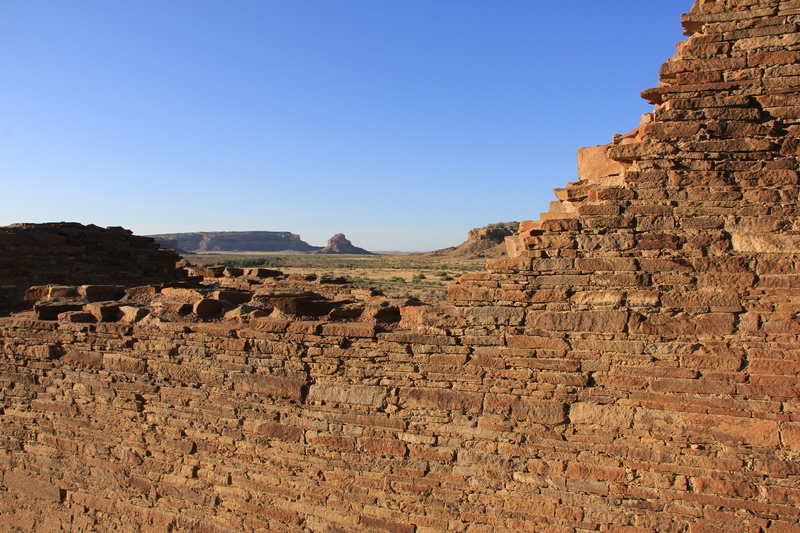 All of the construction at Chaco was built with sandstone, mud and timbers. After a thousand years many walls are still standing. The round holes in this wall once held wooden vigas. Vigas are log beams that supported roofs and formed the floors in the rooms of the Great Houses. The vigas were 15 to 20 feet long and about 9 – 10 inches in diameter, weighing near 600 pounds. Chaco Canyon is an almost treeless landscape. The Chacoans cut spruce and pine trees in the Chusca and San Mateo mountain ranges for their vigas and carried them home. The Chacoans had no draft animals or knowledge of the wheel. The forests are 60 miles away. Latillas are long wooden poles, 2 – 3 inches thick that are placed close together on top of and perpendicular to the floor/ceiling vigas. This makes a solid deck or platform. A layer of bark is added on top of the lattillas to seal any spaces and then a cover of dirt is compacted over the surface. The mortar used to bind rocks together was made of clay soil, sand and water. Although infrequent, rain storms would dissolve and weaken the mud mortar joints over time. This required a significant amount of labor spent in maintenance of walls and buildings. 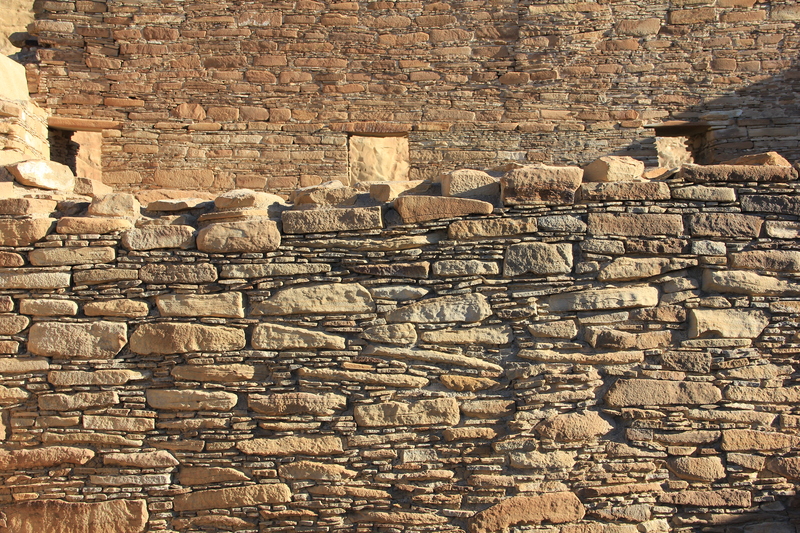 When the Chacoans began to build higher and more extensively they found that by increasing the stone to stone contact the result would be a stronger and much more stable wall. They also decreased the mortar joints filling the space with spalls and stone chips and coincidentally decreasing the maintenance of the mud mortar exposed on the wall face. Chacoan masonry styles subtly changed through time. Archeologists have labeled the styles or building periods as Type I through Type IV and a final McElmo style. 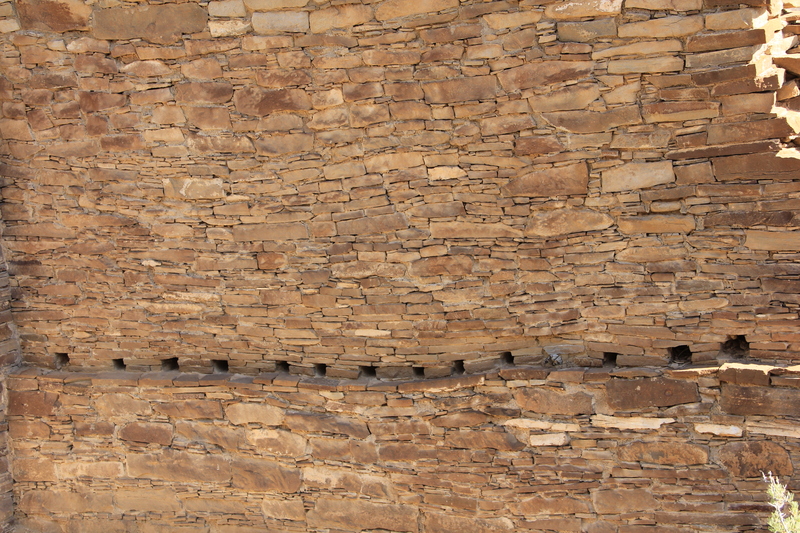 The earliest construction projects were built with uncoursed large stones with wide mortar joints. 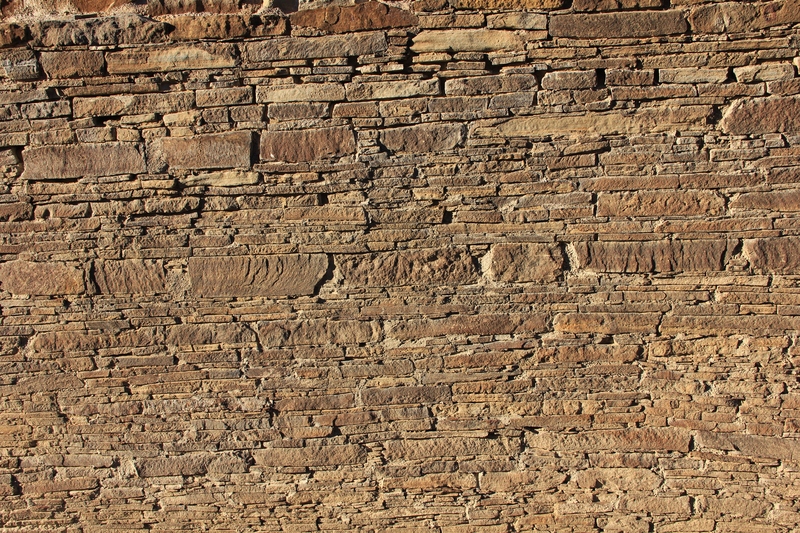 Type II saw a new technique develop: long thin slabs of hard tabular sandstone with the edge snapped flush or scabbled. Type III: Flush face with very thin mortar joints, alternating bands of one or two courses of large brick-shaped stones and three or more courses of smaller, thinner tabular stones. Type IV: Thin hard tabular stone alone. 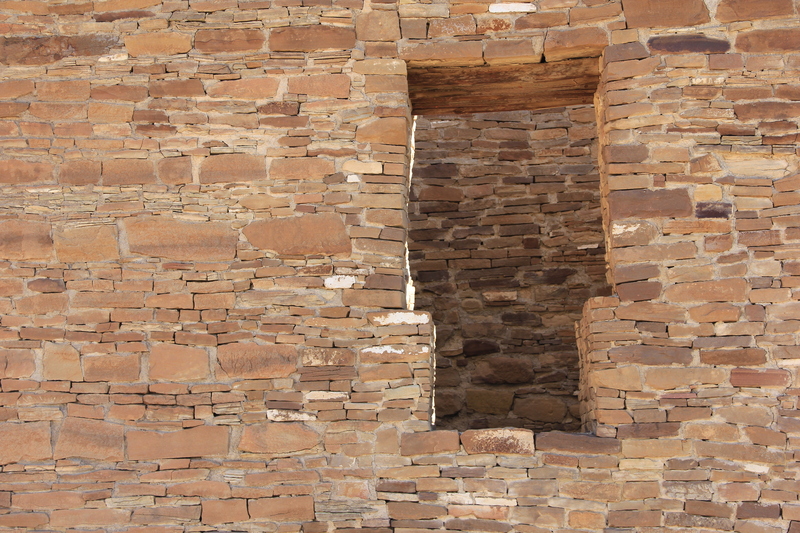 The McElmo style was used in the last phases of Chaco architecture and larger blocks of stone were used more frequently but still in a distinctive pattern with flush cut wall facings. Each stone had to be mined or found, transported, shaped and put into position. Generally, only the exposed face of the stone was carefully shaped. The upper and lower surfaces, as much as possible were left unmodified. Given a stone of the required vertical dimension, several techniques were used to shape the face. These include simple fracture, grooving and snapping, spalling, pecking, and grinding. Buff colored sandstone was readily available in the talus slopes of the canyon. Further up the canyon walls were deposits of a reddish stone. It was worth quarrying the harder dark stone as it was easier to fracture. The buff sandstone required more grinding to shape it. The earliest dwellings were built with simple walls one stone thick, held together with generous courses of mud mortar. Then for a short period thicker walls were built by having two adjoining walls side by side. When the Chacoans began to build higher they built walls broad at the base with thick inner cores of rubble. The facing stone was a fairly thin veneer that was cut or frequently ground to be flush for hundreds of feet of wall. These walls tapered, narrowing as they rose higher to evenly distribute the weight from the 3 or 4 story walls, more evidence of the planning that went into the large scale construction of the great houses. The great houses of Chaco Canyon were built by people with a good supply of stone, a developed level of craftsmanship and a lot of patience. 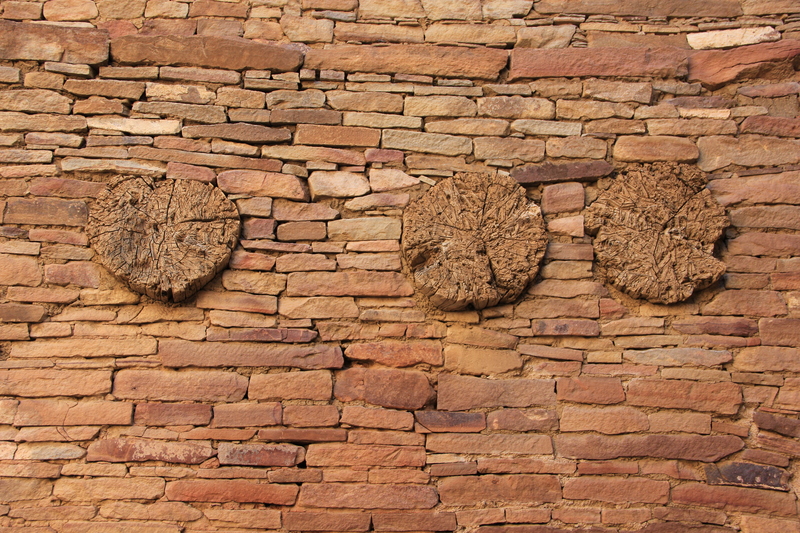 Craftsmanship is a difficult quality to measure but none can compare with the outstanding masonry of the Chacoan culture. 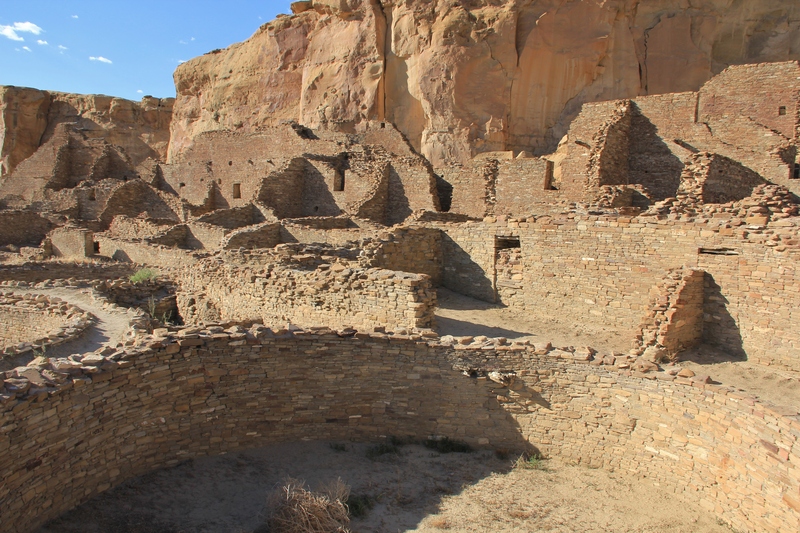 From 900 AD the Chacoan culture flourished then by about 1150 AD the people deserted their great houses. The migration is a mystery as much as what inspired these people in the beginning. I have several stone walls to build some time in the next few years at my place, the Lower Farm. Now that I have refreshed my memory on Chaco masonry I plan to replicate some of it at home. That would certainly mark an achievement. This entry was posted in Art, earth, history and tagged architecture, history, New Mexico, photography, preservation. Bookmark the permalink. Fascinating read and I love your photographs, Dohn. Extra – ordinary indeed Julian. Scientists call it a phenomenon. Hope the harvest season goes well for you. Mahalo,Dohn. Dohn, your article is received with timely intrigue. I have finally found time to read “A Pattern Language – an architectural document of archetypal language which allows lay persons to design for themselves.” The book is full of examples contained in the Chacoan style and a reminder to explore and honor the ancients. Thank you for the inspiration. Aloha Dianne. 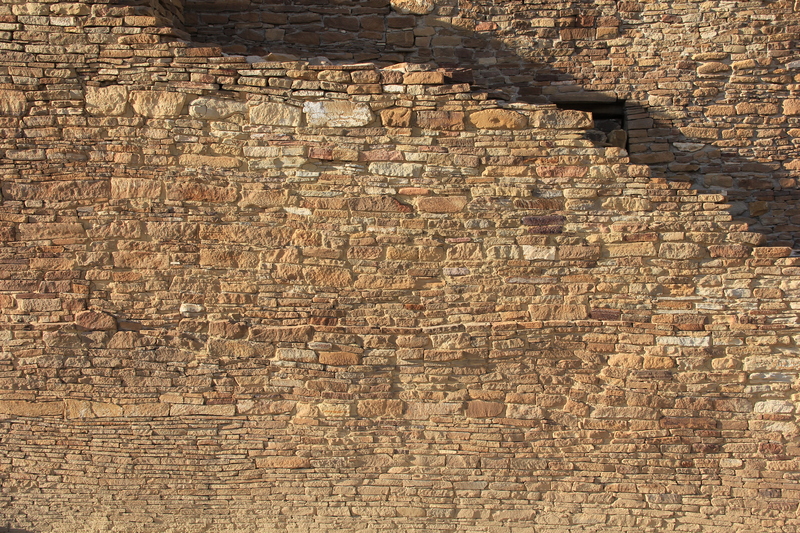 This trip to Chaco was all about exploring the patterns in stone……and honoring the ancients. How fitting. Thanks. Beautiful and amazing. Thank you. Good luck with building the Chacoan style. Thanks for a great article. My wife and I were stunned by what we saw at Chaco Canyon a few years back. We had been to Mesa Verde a number of times, but it didn’t prepare us for the sheer size and magnitude of Chaco. Good article — thanks for sharing. You are welcome Mitch. It’s a great place to experience wonder.